You must be thinking that Bangkok is definitely not the longest city name however, look at the traditional Thai name – “Krung Thep Mahanakhon Amon Rattanakosin Mahinthara Yuthaya Mahadilok Phop Noppharat Ratchathani Burirom Udomratchaniwet Mahasathan Amon Piman Awatan Sathit Sakkathattiya Witsanukam Prasit”. Wow, right? That’s the complete Thai name of Bangkok and has been listed as the longest name for a place in the Guinness Book of World records. Bangkok is the prime and most populated city of Thailand with one of every ten Thai people living there. All of the temples pictured on the Thai baht coin are in Bangkok. Along with Male and Female washrooms you will find a third option for transgender washrooms in Bangkok. Thailand is now one of the first countries in the world to introduce this. There are around 200,000 US$ millionaires in Thailand. 95% of these millionaires live in Bangkok. Bangkok’s Chinatown is frequently stated to as the largest in the world. On top of this, Bangkok’s Chinatown also boasts the largest solid gold Buddha in the world. 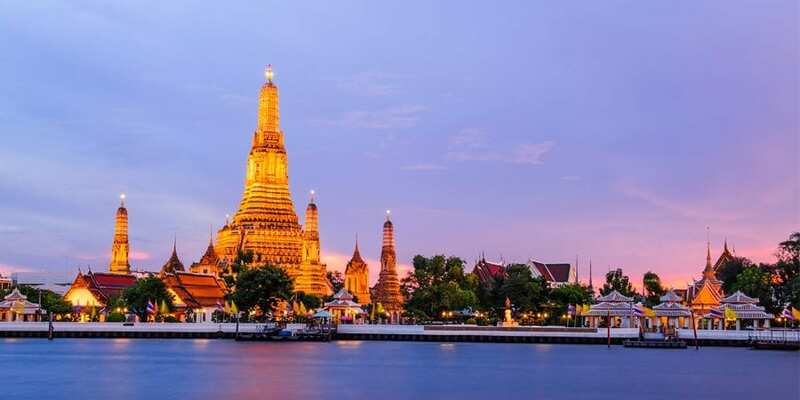 Bangkok holds the title as the world’s hottest city! It’s not that daily high temperatures are really extreme, it’s more the fact that the city remains hot year around. Sweaty Betty alright! The world famed energy drink Red Bull was created in Bangkok by Chaleo Yoovidhya in 1976. At the time of his death in 2012, he was the third richest man in Thailand. At 132.2 metres, Bangkok’s International Airport features the world’s tallest aircraft control tower. The King’s Anthem is played before movies and cultural performances. Fancy a trip to Thailand? Starting in 2017 Travel Talk Tours will be offering 7-13 day tours that all either start or finish in Bangkok so you have plenty of time to explore this magnificent city!